Validata SAS enables real time synchronization, conflict resolution and support for many defect, QA, and CM systems. Streamlines the entire ALM lifecycle from business flow modeling, requirements visualization and project planning; configuration management and data integration; build and release management; end-to-end automated testing; defect and change management; and configurable Dashboards. Provides automated server side data integration for visibility and reporting across multiple systems in heterogeneous environments. It powers innovation and improves productivity by connecting roles and disciplines across the project lifecycle. 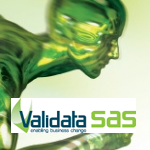 Serving as both an ALM integration and migration suite and as an end-to-end automation cloud-based solution, Validata SAS enables early testing, aligned with business goals even as requirements and realities change ensuring continuous delivery and improved efficiency.